Philip Bobbitt, a historian of nuclear strategy who has served in the White House, the Senate, and the National Security Council, brilliantly addresses the transformation of the nature of war and, with it, developing changes in statecraft as profound as history has yet seen. "One of the best books in 2002 on politics and current affairs." "Majestic … It is also argumentative, opinionated, brilliant." "A triumph … Grand in scale and original in concept, amazingly learned, often provocative, consistently absorbing." "It is easy to feel, as Virginia Woolf once said about an earlier cataclysm, that after Sept. 11 human consciousness changed, that before hand no one could have guessed at the kinds of traumas and transformations that were about to unfold. But judging from this book (which after a decade of work, must have been all but complete at the time) the historian Philip Bobbitt had a pretty good idea … Mr. Bobbitt's evolutionary map of warfare's impact on the state foreshadows the kinds of events still unfolding. What has happened since (even last week's announcement that Russia is now affiliated with its onetime nemesis, NATO) fits eerily well with his speculations … This book is magisterial in its scope and ambition." "[T]his sensitivity is reflected in the worldliness of his analyses. His urbanity is not merely intellectual; he has a highly developed and quite unacademic feeling for power, a feeling attainable, perhaps, only by those who have had some share in its exercise … This book – with its masterly reappraisal of modern history and subtle elucidation of today's geopolitics – should be on every desk in the State Department." "Philip Bobbitt is to be saluted for undertaking an epic struggle to sort through an extraordinarily dynamic time in international affairs." "I take off my hat to the author for the boldness of his enterprise, for his scholarship, and for his capacity to get the reader to think along new lines … The Shield of Achilles may well become a classic for future generations." "THE SHIELD OF ACHILLES should become required reading not only in the academy but for the military and civilian decision-makers of the industrialized world." "Bobbitt's central message is the reminder that a state's legitimacy is tied to its ability to monopolize the use of force and operate effectively in an international strategic environment. Today, however, the capacities of states to do so are changing rapidly – and thus so will the character of the modern state." 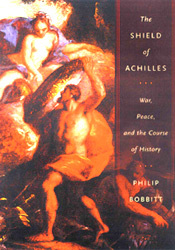 "In the Shield of Achilles, Philip Bobbitt presents an extraordinarily sophisticated and comprenhesive survey of war, peace and nationhood … [It] will enhance the intellectual underpinnings of policy by encouraging the next generation of national and global leaders to consider the complex issues they will have to address. Philip Bobbitt has made a valuable contribution to wider understanding of how the world really works." "From the fascinating account of the partnership of Colonel House and Woodrow Wilson to the extended discussion of the Yugoslav breakup, this book will certainly stimulate a needed discussion of America's foreign policy, especially as we drift into a state of endless war against an amorphous foe." "Once in a great while, there comes a book so ambitious in scope and so original in its insights that it challenges our comfortable patterns of thought and provokes widespread discussion in academic and political circles. The Shield of Achilles clearly does…a rare and important book." "Indeed, what is truly curious is not the radical revolution in science and culture that again Mr. Bobbitt so deftly and comprehensively describes – computers, global communications and transportation, nuclear proliferation, and random terrorism – but how the United States through its reactionary 18th century Constitution, unwieldy Congress, and traditional carriers, jets, and subs, has been able to keep the peace and protect its citizens without creating new consortiums or altering its existing political framework. All that may change. But for now, Mr. Bobbitt's often brilliant catalog of the current global chaos remains just that – an astute diagnosis." "This book is a passionate and worthy effort to make sense of what is clearly a brand new world. And it is a useful antidote – if one is necessary after September 11 – to the notion that the defeat of communism means we all live in a safe neighborhood." "With seasonal regularity a book appears that bids to be the one weighing down the briefcases carried in and out of government agencies and corporate headquarters. Invariably, the book contains a stark thesis, an easy fluency with history, and a set of prescriptions addressing future threats and opportunities. Philip Bobbitt's book might be seen as the latest such bid, but it's actually a considerably more nuanced, sophisticated, and in parts powerful avatar than this lineage often generates." "The Shield of Achilles: War, Peace and the Course of History," by Philip Bobbitt. Yep, this one is just as serious as it sounds. On the other hand, it is such a good mind-stretcher, such a gift for getting one's head out of daily minutiae and onto more enduring and important matters. Like a good teacher, Bobbitt first tells you what he's going to tell you, but I found plenty of surprises along the way. This is a big book in every way: Bobbitt is weaving together enormous amounts of history. It seems to me more the way Europeans approach history than the way Americans do (although Bobbitt teaches at the University of Texas Law School and is, incidentally, LBJ's nephew.)" – Molly Ivins, "Holiday picks for bookworms."